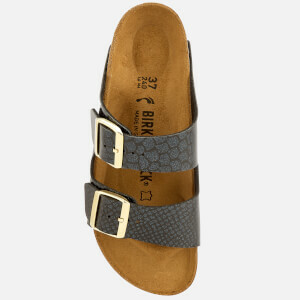 Women's snake print Birkenstocks with easy-clean Birko-Flor® uppers; an easy-to-care-for and hygienic PVC material that is lined in breathable fleece for next-to-skin comfort. 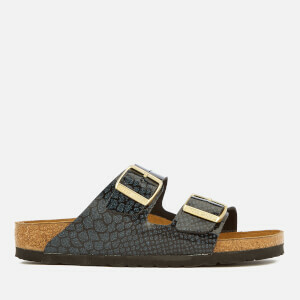 The iconic two strap Birkenstock sandals showcase the brand's limited edition 'Magic Snake' print with a glossy, snake-effect finish, and are secured with two adjustable buckles. 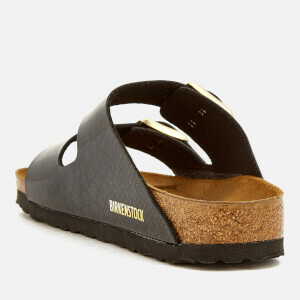 The slim fit 'Arizona' Birksenstock sandals are set upon a shock absorbing EVA sole that offers both comfort and support, further enhanced with a trademark contoured cork footbed with deep heel cup, toe grips and built-in arch support. Soft suede lining and embossed branding to the hardware.